Music Therapy is the use of music to attain non-musical goals. Where a physical therapist will use balls and bars, I use music as my tool to facilitate change. The goals reached through music therapy are typically social, physical, or cognitive. Research in Music Therapy supports its effectiveness in many areas: increasing motivation and engagement in treatment, relaxation and pain management, providing emotional support for clients and their families, and providing an expressive outlet. at the ends of our lives? 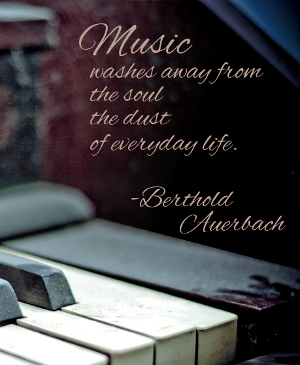 Music forms the basis for some of our deepest feelings and most treasured memories. A trained, board certified music therapist works with clients to provide closure, build feelings of meaningfulness, and connect with their loved ones. What goals can my loved one meet through Music Therapy? Music therapy can be effective in addressing many typical end of life realities. I've worked in end-of-life hospice care for three years. One patient, in her last days of life, was consumed by dementia. She did not remember her children and could do nothing to care for herself. In the six months I worked with her, one beautiful session stands out. I played a Johnny Cash song for her, and she immediately came into the present and told a story about being at a concert with Johnny Cash, Jerry Lee Lewis, and Elvis Presley, when she was 14 years old. Her son (who was present for this session) told me he had never heard this story and was delighted that he could be there to witness her moment of clarity. Many times, after a preferred piece of music was played, she would briefly show alertness and awareness of her surroundings and tell stories or speak with her children. After her death, the family asked me to play her favorite songs at her funeral. What an honor to play "Ring of Fire" for the her family and see their smiles at the memory of Mom at her best. An individual’s growth through music therapy can improve the quality of life for the whole family. The shared, equalizing experience of making music together can improve family cohesiveness, support, and coping skills. When you're ready, you can contact me to set up an appointment. Typically our first meeting is a no-cost consultation where we discuss your loved one's condition, the goals you'd like him or her to pursue through music therapy, and get a sense for who I am as a therapist. If you're not ready to call yet, I've compiled much more information about Music Therapy that you can review from the navigation bar on the left. I'd recommend starting with What to Expect from a Music Therapist, and the more detailed Music Therapy and Hospice or Music Therapy and Alzheimer's pages. Is There Research to Support Music Therapy for End of Life Care?